My guess is you’ve probably heard of the notion of opening the third eye and that’s why you’ve arrived at this website. My name is Steve G. Jones, Clinical Hypnotherapist, and for more than 25 years, I have been helping people create positive and lasting change within their lives through the power of hypnotic influence. The mind has always been something that fascinates me. Ever since I was a young boy, I had an almost obsession­-like interest in the human mind and how it affects every other aspect of one’s body including decisions, thoughts, organ functions and even our chemical makeup. The idea that one single thing is controlling everything else led me to want to learn everything I could about enhancing it’s capability, as doing so would positively affect everything else. I guess I could have pursued a career in the medical field, but there was an element missing and as a result, that path would have quite simply left me bored to death. For me, the metaphysical aspect of the body is where my true interest and fascination lies. As a teenager, while most kids were involved in sports or going to parties, I was exploring things like astrology, reading auras, astral projection and things of that nature. And I guess the reason why is because of all the mysticism behind the metaphysical. People from all over the world have experienced metaphysical effects, but many of those same people still doubt much of it. You see, the metaphysical world can be an abstract concept if you don’t know how to navigate within it. And when people don’t believe in the principles of the metaphysical world to begin with, it’s almost impossible for them to use it to their advantage because they don’t believe there is an advantage to gain. And the result is that they experience life in the third dimension forever trapped in the confines of their gated reality because they never take the first step. The two eyes that each person has exist in the physical world, thereby allowing you to see all that exists in the physical world. But each of us also have a third eye, which is a metaphysical organ that enables us to see things in the metaphysical world. And opening it, can be easier said than done. Expanding Your Being - Here you will discover things within you that you may have never seen and how you utilize to your advantage. Manifesting Response - Here I will show you how to strive for a spiritual experience to help you realize a physical response. Visualization With Ease - Learn to visualize without forcing the experience. Shielding Mastery - Here I’ll show you everything you need to know about protecting yourself psychically. Phase One Opening - Here you’ll discover the first technique essential to opening the third eye. Third Eye Body Essentials - Here you’ll learn to identify and explore three key areas of the body that accelerate the opening process. The Hidden Power - Here you’ll learn about a unique power that all beings have and the role it will play in opening the third eye. Energy Enhancing Techniques - Here I’ll show you my personal exercises that will help raise the energy within. Phase Two Opening - Here I’ll share the second essential technique to bringing the third eye experience to reality. Third Eye Awareness - Here you’ll discover how to increase the awareness of your third eye and why doing so, will magnify the entire experience. Phase Three Opening - Here we’ll move on to the next set of techniques designed to transition the experience from phase two. Third Eye Perception - Learn how to observe perceptions from your third eye so you can now see what you cannot with your physical eyes. Etheric Communication - Learn exactly what you need to do in order to communicate with your etheric body. The Astral Experience - Discover the methods I have been teaching to people for years on creating a vibratory and astral experience. Advanced Techniques - Here you’ll be exposed and guided through an advanced set of exercises that will enable you to tune in whenever you choose. Tuning In - Learn how to tune into your third eye at will and with ease. The Vortex - Here you’ll learn everything about the vital role of focused areas of energy called vortices. If you are ready to take the first step toward experience beyond the third dimension, then I invite you to take advantage of this unique opportunity to own a resource that will provide you with all the tools you need to do so. Until the creation of this program, the only way to get access to this information was through a private session in my office which nowadays runs around $25,000 (no, that is not a typo). Now, you can have the same knowledge and gain exposure to the same secret techniques, from the luxury and convenience of your own home, for not even one percent of the cost of a private session. That’s right, for just $27.97, you can own one of the most effective programs on the planet for opening the third eye. 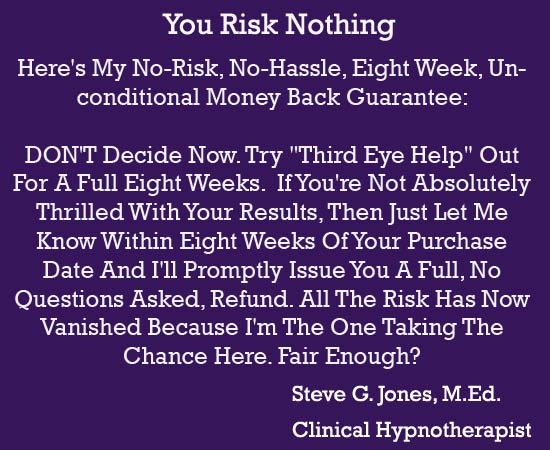 But wait, I’m going to make the decision even easier by allowing you to try the Third Eye Help program absolutely risk free. So let me ask you, are you ready to experience the next dimension? Are you ready to see everything that exists beyond your current scope of reality? If so, then don’t wait any longer. 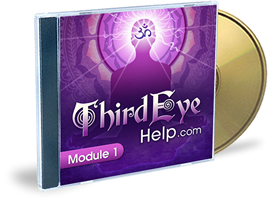 Take the first step now by getting Third Eye Help! Click the Button to Order For Just $57.00 $37.97! P.S. 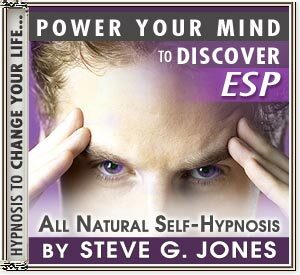 - This is the only third eye program created by Steve G. Jones, creator of the largest set of hypnosis recordings on the planet so don’t fall for cheap imitations. P.P.S. - Remember, you have nothing to lose and everything to gain because you have the next 8 weeks to see how truly effective this program is, risk free.